A great solution for simplifying digital workflow, HDMV-KM KVM Multiviewer offers simultaneous keyboard, video and mouse emulation on four computers, all from the convenience of one monitor. Designed with user ease in mind, this KVM multiviewer features seamless switching from one computer to another via mouse operation. Simply drag the mouse from window to window to start controlling the selected desktop: it's that easy! 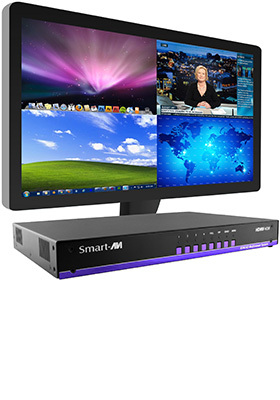 SmartAVI's HDMV-KM is an HDMI and USB 2.0 Multiviewer device, with high definition video output up to 1080p (1920x1080) and full keyboard-mouse emulation. View and command multiple HD sources in various advanced viewing configurations like dual, quad, and picture-in-picture modes. Transition between these multi-view options and a full-screen setting with one click of a mouse's scrolling wheel, then revert back with another click. It is flexible, functional, and effective. The perfect supervision solution for data centers, security stations, protective agencies, corporate networks, and command centers of all kinds, HDMV-KM offers comprehensive control with maximum convenience. So whether users are watching multiple camera feeds or taking charge of workflow on four remote servers, HDMV-KM ensures the best multi-viewing and command experience available every time!